DreamWorks Animation CEO Jeffrey Katzenberg spoke with The Hollywood Reporter recently about current and future film projects. According to him, How to Train Your Dragon has reached that magical turning point where it will definitely have a sequel — currently scheduled for release in the summer of 2013. There is also a TV series, a virtual game environment, and a live stadium show similar to Walking with Dinosaurs (!) in the works. In addition there’s Scared Shrekless, a Halloween special coming this fall, to be followed by a Kung Fu Panda TV special sometime after Thanksgiving — but don’t, says Mr. Katzenberg, call it a Christmas special. And here YOU all thought Homer Simpson invented Spider Pig! Well, the folks at Marvel Comics have decided to clear things up (?) with the release of The Spider Ham 25th Anniversary Special. Here’s the press-release for this upcoming full-color one-shot: “Written by Tom Defalco and Tom Peyer; penciled by Jacob Chabot, Agnes Garbowska, and Adam Dekraker; cover by Joe Jusko. When J. Jonah Jackal, Mary Crane, and Pete’s beloved Aunt May are kidnapped on his 25th birthday, Spider-Ham must battle Doctor Octopuss and the Swinester Six! Six-to-one odds? Don’t get your tail in a bunch — when the slop’s on, this pig throws down — and Tom DeFalco & Jacob Chabot (X-Babies) are there to bring it to you. Then, take a look into the many possible fates of Spider-Ham as the Assistant Watcher answer the questions you never really thought about in Marvel: Why Not? – a six page Spider-Ham Extravaganza by Tom Peyer (Amazing Spider-Man) and Agnes Garbowska (Girl Comics). Finally, in the not too distant future, Swiney-Girl, the daughter of Spider-Ham, returns to face down Crayfin’s Last Bunt! by Tom Defalco and Adam DeKraker (Marvel Zombies: Evil Evolution)”. You read it here, people. Look for all the fun coming your way in June. No less than animation historian Jerry Beck has assembled The 100 Greatest Looney Tunes Cartoons, coming this June in hardcover from Insight Editions. How? He polled thousands of animation fans, historians, and animators to gather their thoughts and favorites… and here are the results. From the press release: “Evaluated on their comedic brilliance, innovative animation, historical significance, and creative merit, cartoon historian Jerry Beck and the Cartoon Brew team of animation experts reveal the amusing anecdotes and secret origins behind such classics as What’s Opera, Doc?, One Froggy Evening, and Duck Dodgers in the 24½th Century. Featuring more than 300 pieces of original art from private collectors and the Warner Bros. archives, The 100 Greatest Looney Tunes Cartoons settles the debate on the best of the best, and poses a new question: Is your favorite one of the greatest?” The introduction was written by movie critic (and famous animation fan) Leonard Maltin. Three black & white manga titles published by Yen Press have recently caught our eyes. Cat Paradise (written and drawn by Yuji Iwahara) tells the story of Matabi Academy, where students are allowed to keep their pet cats in their dorm rooms with them. Trouble begins with a bang when a rip between the worlds occurs and a violent cat-demon intent on revenge is released. Now the students and their friendly cat-spirit companions find themselves in a battle not only for their lives and their school, but for the whole world! Then there’s Laon, written by Young Bin Kim and drawn by Hyun You. Laon is a magical nine-tails fox who found himself on the losing end of a bet in Heaven. Now he finds himself cast out of the realm of the gods, sent to earth in the guise of a young boy — and all of his tails have been removed, cast to the four winds, along with his heavenly powers! Now the exiled fox is determined to get back his powers, and his place in Heaven, one tail at a time! Yen Press is also the home of Spice and Wolf, of course. This popular manga by Isuna Hasekura and Ju Ayakura follows the medieval adventures of a human merchant and his friend, a pretty Wolf-God of the Harvest. Volume 4 of Cat Paradise and Volume 2 of Laon are coming from Yen this May. Volume 2 of Spice and Wolf will be out in June. Andreas Deja is a very well-known animator who has worked for Disney animation for 30 years now. He’s known for animating characters like Gaston from Beauty & the Beast and Lilo from Lilo and Stitch, but furry fans probably know him best as the lead animator of Scar in The Lion King. Now Andreas has taken his particular affinity for drawing and animating animals (which he said Lion King was his first opportunity to do as much as he likes to!) and collected together some of his best sketch work into A Different Stripe: Andreas Deja’s Animal Sketchbook (in soft-cover, from Stuart Ng Books). In it he not only discusses his methods of drawing animals (both realistic and anthropomorphic) but also the advice and guidance he received over the years from such animators and teachers as Ken Hultgren and Marc Davis. In other words, keep spreading that amazing word-of-mouth, people! They’re a musical band called Hevisaurus. 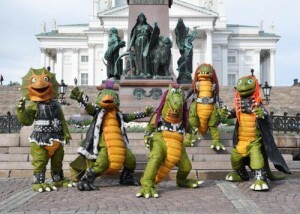 They’re a heavy metal band for children (wrap your brain around THAT concept for a moment) that is creating quite a stir in Finland. Why? 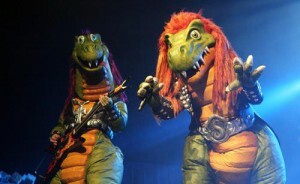 Because live on stage and in their videos the band’s members dress up in full-body dinosaur costumes! And the kids have been eating it all up. Their first album Jurahevin Kuninkaat is a certified hit in Scandinavia, and several of the band’s videos (like this one and that one) are getting a lot of views on YouTube. One thing there is not a lot of (yet) is background information on the band, other than the fact that members of several well-known heavy metal acts (including Dio and Sonata Artica) play in the group. But who conceived this? And who designed and built the costumes? Inquiring furry fans want to know! Interestingly, it seems that the actors inside the costumes really ARE musicians and really DO play their instruments, at least live in concert. If you can navigate your way through the Finnish, you can check out their web site and MySpace page.